But... only if you want to really be able to defend yourself against some of the most difficult attackers you'll ever have to beat! ...and learn what you should be doing in your training to be able to be prepared for - and DEFEAT - a trained MMA / UFC fighter, street-hardened gang-banger, or other attacker who's hyped up on drugs or has a high tolerance to pain! Register now for this free online training event. 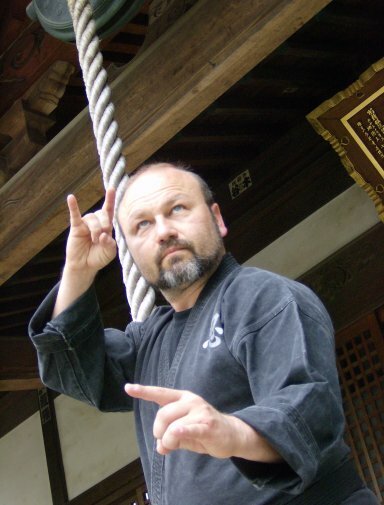 During this live teleseminar, Shidoshi Miller will be opening the doors for a peek inside the world of real ninjutsu self-defense combatives training - the kind of training that made him give up everything else to train in Bujinkan Ninjutsu in 1980! ...against a trained MMA / UFC Fighter, experienced and street-tough gang-banger, an attacker who's under the influence of certain drugs, or the enraged attacker who has a high tolerance to pain! Training ideas, exercises, and drills that will help to prepare you for dealing with, and defending yourself against, a super-aggressive and highly-determined attacker! ...this event is being limited to the first 30 students who register for this critical training. So, you'll want to sign-in up to 15 minutes early to make sure that you get one of the live seats. What Else Will You Be Learning? During this powerful training opportunity, you will also have the opportunity to ask up to 3 questions about anything that is challenging you in your training and progress. And, you will get Shidoshi Miller's honest answer, based on his three (plus)decades of study, insight, and experience in applying these lessons... against real attackers... on the street, and on the job as a police officer, undercover investigator, and bodyguard. And, he will also tell you about some new training opportunities that are just around the corner, and a special discount that you can get for yourself - just for being on this call. So, if you want a chance to work with Shidoshi Miller personally and learn some serious, life-saving strategies for dealing with some of the most brutal assailants that you could ever face - if you want to learn why most practitioners of the martial and self-defense arts are totally unprepared for the kind of animal-like aggression and skills that are needed to survive a real, life-and-limb kind of attack, then you want to be on this call! to get this powerful training from Shidoshi Miller. But......all is not lost! Make sure that you're subscribed to Shidoshi Miller's online ninjutsu training newsletter to get information about when the next training is being offered. Also, as a subscriber you will receive several free lessons, training articles, special, free, bonus reports and more! Subscribe by scrolling back up and using the form on the right side of this page. Not receiving the Shidoshi's online ninjutsu training newsletter? Just complete this form and start receiving free articles, lessons, strategies and tactics, and invites to join him for some of the best ninjutsu training opportunities available - online or off! Subscribe now and get a free Ninjutsu self-defense combatives training ebook that will walk you through the skills and abilities that you'll own as you progress through each of the Black Belt levels! I HATE Spam! So, you can be safe in knowing that I will never sell, trade, or give away your information for any reason.